Trial classes are a great opportunity to come into the studio and see what we're all about. We offer 3 trial classes: Ages 4 - 6, Ages 7 - 12, and Ages 13+. Classes are offered the Saturday before Winter, Spring, and Fall classes. There are no trial classes in the Summer. See below for the upcoming schedule & registration links. All trial classes require a non-refundable deposit to hold your spot but it can be applied to future enrollments. Just ask the office to apply the trial class fee to your class cost before registering for the class. When you arrive for your trial class, a member of our staff will greet you in the lobby with information about the class, where to put belongings, and guide you to the check-in window. Students will wait in the lobby until it is time for class. Their instructors will come introduce themselves and ask the class to come into the studio space. Parents can watch the class on the studio monitor located in the lobby. Parents are not permitted in the space in order to keep the classroom distraction-free for students. At the trial class, students will receive a list of classes they are eligible to sign up for and registration will also be available during this time. A staff member will be available in the lobby and behind the front desk if you have any questions about classes, SHOW, or any of our programs. Trial classes cover a sampling of what circus has to offer. We will work on various apparatuses so that students can get a taste for circus training. 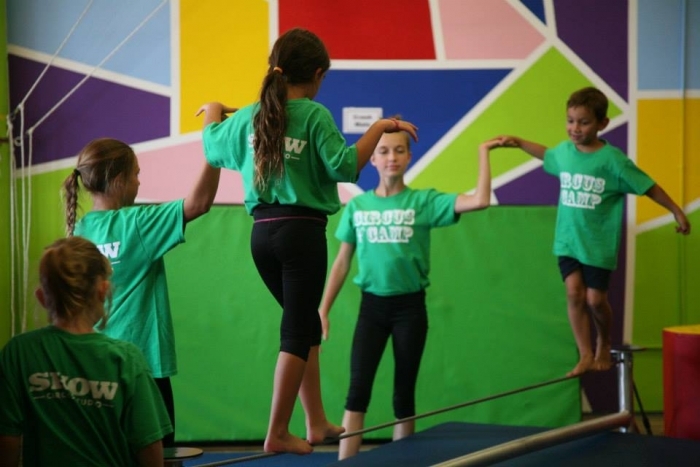 Weekly classes will dive deeper into the material covered and focus on many more circus skills. All trial classes require a fee to enroll. The fee can be applied towards the cost of a future class. Just ask the office to apply the trial class fee to your class cost before registering for the class. Make sure you register you/your child with our Pike13 registration system if you plan on attending any programs here at SHOW Circus Studio. This system is how we process payments, keep track of registrations, store client information, and communicate with our students. The only information we will ever need is asked during registration, so be as thorough as you can in your profile. You will be sent a digital signature request for our waiver after registration. Parents are managers of their children's accounts on Pike13. You can select to sign yourself up or sign you and your child up. Please make sure you select the correct option on the registration screen. Not sure how to update your child's information in Pike13? Click here to view our PDF guide. Have additional questions about trial classes. registrations, or other SHOW programs? Contact the studio and we'll help answer your questions.